But how can I possibly still enjoy my favorite southern-style favorites (I’m lookin’ at you, fried chicken!) without breaking out the oil and frying pan? When I make fried chicken, I want it to be golden brown and crispy, and you can’t achieve that kind of magic by throwing it in the oven to bake! But that, my friends, is where the Power Air Fryer XL™ stepped in to save the day, and it’s completely changed my fried chicken game in a really BIG way! Would you believe me if I told you that you can now fry your favorite foods using little to NO oil at all? You can have no greasy mess, no added calories, and no guilt in indulging in your southern-fried favorites! The first time I saw the video advertisement shown below, my first thought was, “What kind of sorcery IS this? ?” I loved the idea of not using oil to achieve perfectly crispy fried goodness, but I was very doubtful. After all, I’ve spent my whole life knowing only one way of frying foods – and that’s with oil. But Y’ALL! Believe me you must, because this thing is the real deal! I’m still convinced that this gizmo totally is sorcery, but it’s the kind of sorcery that I can totally get down with! Plus, it makes some dang delicious and crispy foods that I’ve just got to share with you! I decided to test test the waters a little bit by making a batch of traditional southern fried chicken. I knew right off the bat that if the Power Air Fryer XL™ could deliver a golden and crispy batch of one of my favorite comfort foods, it’d earn the highest honors in my mind and quickly become part of a big lifestyle change for me and my family. To get the party started, I broke out the handy dandy recipe book that came with my Power Air Fryer XL™ and went straight to the recipe card for fried chicken. I tweaked it just a smidge to my own taste, and then I broke out the chicken and batter and was ready to (air) fry! For this recipe, I decided to use chicken drumettes because they’re my very favorite. I tossed the chicken in a bowl and covered it in a layer of creamy buttermilk. I covered the bowl and let it set in the refrigerator for about 2 hours. While the chicken was sitting, I went ahead and mixed up the flour and spices to batter the chicken with. After the chicken sat for a while, I removed all drumettes from the bowl of buttermilk and placed them on a plate. 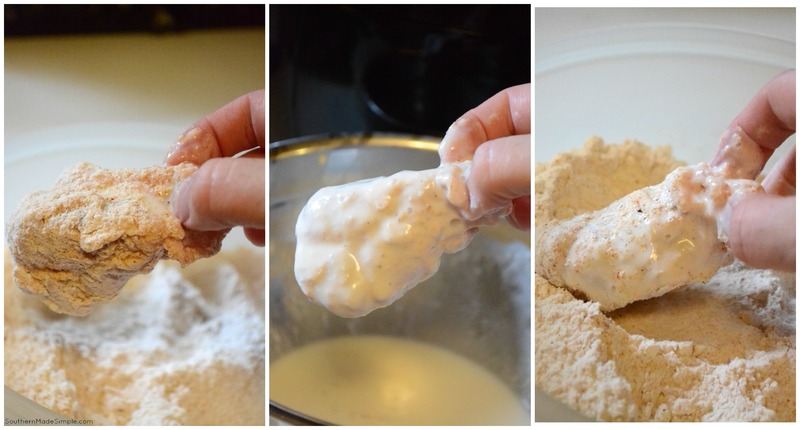 I dipped each piece of chicken first into the flour and spice mixture, then back into the buttermilk, and then once more into the flour mixture. Double battering the chicken really makes it extra crispy and delicious! I placed each piece into the Power Air Fryer XL™ fry basket and set the digital one-touch panel to the chicken setting, followed by the recommend temperature and cook time of 360 degrees for 20 minutes. 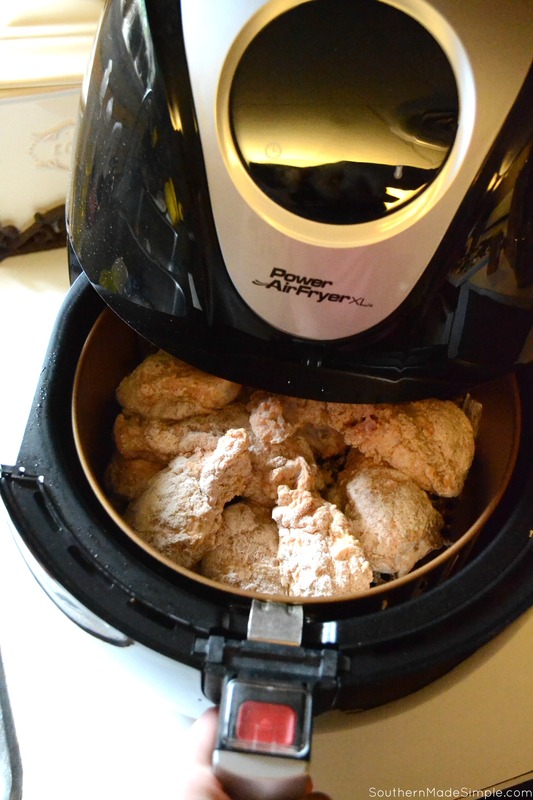 Once the air fryer began cooking, I opened up the basket about every 5 or so minutes to turn the chicken with a pair of tongs to ensure that the battered chicken didn’t stick to one another. After 20 minutes, the chicken was completely cooked, piping hot, and perfectly crispy! I’ll admit that I was in disbelief, but once I took that first bite, I became a total believer! The Power Air Fryer XL™ works by creating a whirlwind of super heated air that reaches up to 400 degrees. The moisture is locked in while cooking so everything cooks evenly every time! Cooking with an air fryer as opposed to oil means that you’re cutting calories by about 80%. Score! Not only can you fry foods with the Power Air Fryer XL™, but you can also bake, steam, grill, and sauté! Pizza, pies, steaks, vegetables – the possibilities are nearly endless! And just like that, you’ve got a batch of perfectly golden crisp southern fried chicken without the guilt! 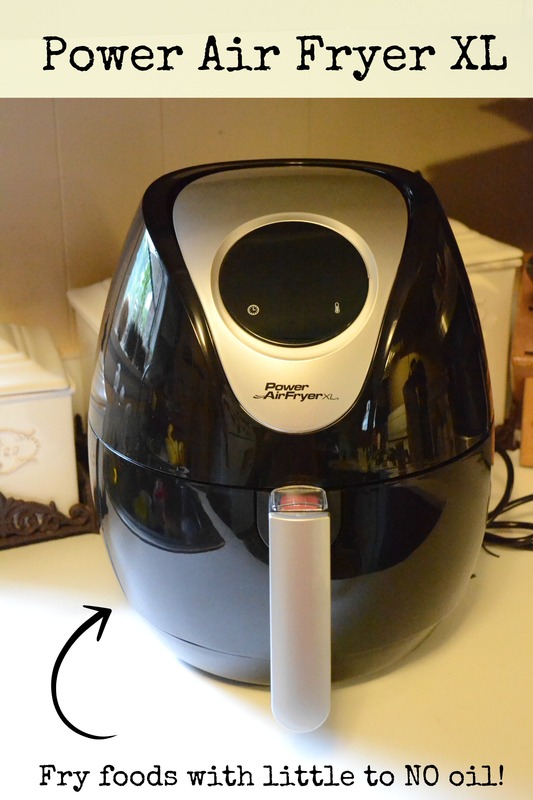 The Power Air Fryer XL™ has been a joy to use, and cleanup is super easy. 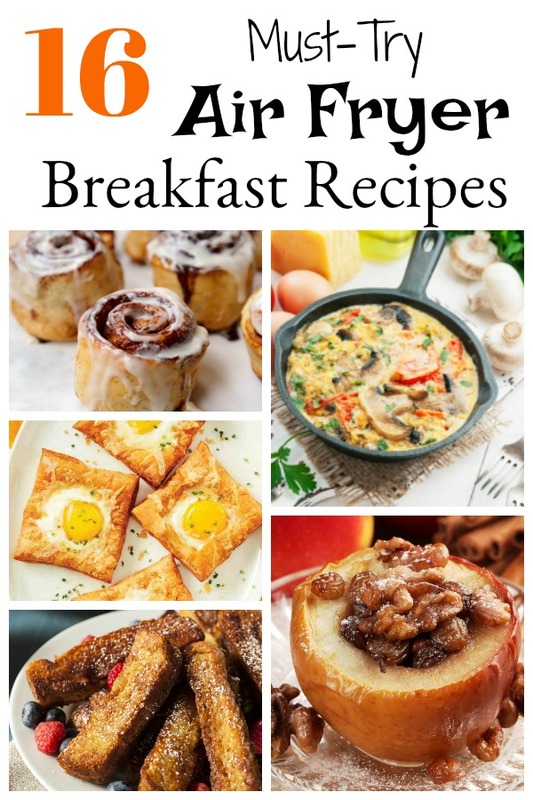 I’m currently making a list of all the recipes that I want to try, and I’m pumped to be able to indulge in all of my favorite foods without the extra grease! 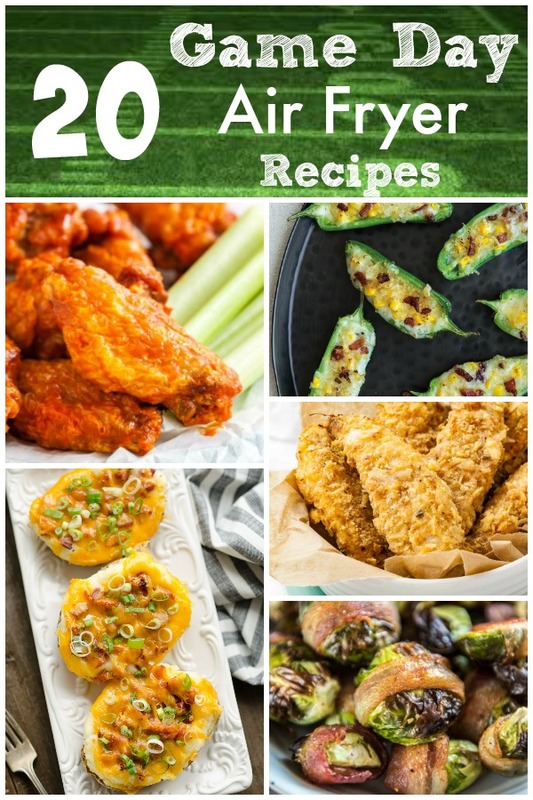 And this roundup of 20 Game Day Air Fryer Recipes! 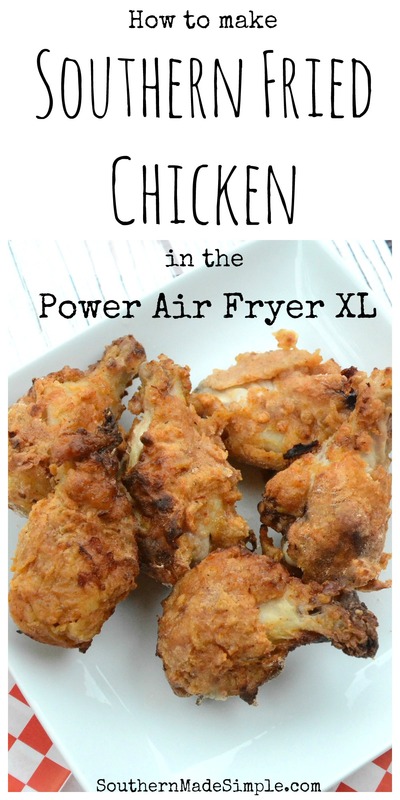 What recipes would you love to make in a Power Air Fryer XL™? Leave a comment below and share the love! Previous Post: « Steppin’ in Style this Summer with pediped Footwear! My boys love making chicken strips and fries in the Power Air Flyer. Easy clean up and no oil. Hi, how long do you cook your chicken strips. My machine didn’t come with any recipes at all so I’m learning as I go. Thanks for any help and suggestions you can give. I absolutely gonna try this! Yummy fried chicken with NO oil!! Thank you for sharing! Tried this, my coating either fell off or burned, parts of the breading still looked raw, after chicken cooked for 20 min, it was still raw in middle, cooked 12 pieces in batches of four, threw out 9 pieces. Not sure if I am going to move on. I used 6 drumsticks and they came out the same as yours. I left 3 in there and fried the other 3. 45 minutes later, the ones in the air fryer were cooked. Great with French fries. Too bad I’m not on a french fry diet. I will try a couple more recipes before I put a review on their site. So far, I’m not happy with this product. I’m a little confused by your comments, we use ours 3+ times a week and the only issue we have ever had was with “fish and chips” (coating on fish never crisped up). You may have a defective unit unfortunately their warranty is not the best. Cornish game hens are better than or at least as good as on the bbq and really juicy/moist. How do “you” make french fries that are frozen in the bag? Hi Ron! There is a setting on the Power Air Fryer XL that is specifically for french fries. Just toss then in the inner pan, set to french fry mode and the magic happens! Thanks going to try that with my next batch. Just put in the amount, add salt and heat at 400 for 20 minutes. I shake them around every 5 minutes. If you don’t, they burn. Can you let the chicken soak in the buttermilk all day while at work? I am just going to try the Southern fried chicken recipe. Have the chicken in buttermilk right now. Will let you know how it turns out. I made a similar recipe last night with chicken tenders and the coating stuck to the basket. By the time it was done I had naked chicken and a basket that had to soak overnight. Thoughts on what went wrong? Thank you! My first time cooking in the air fryer I dealt with something similar. It took a little tweaking for me to get it just right, and I realized that it really boiled down to how frequently I turned the chicken while it was cooking, and also how much chicken I put into the machine. When you have an item that has fresh breading, it’s best to put just a few pieces in at a time and now allow them to touch each other very much so that the air can thoroughly get all around each piece. I know the basket is supposed to be nonstick, but it doesn’t hurt at all to spray it with a little cooking oil if you feel like that would help with the sticking. It’s important to turn the chicken fairly frequently to prevent sticking, too. I hope this helps you a bit! How many wingettes do you make in each batch? Yeah, wel, the a/f, doesn’t do well with runny batter. Press chicken into seasoned flour, egg wash, then coat with mixture of panko, and 1/2 cup of instant mashed potatoes. 390 degrees for about 15 minutes. Turn halfway thru. Meat thermometer to read 165 degrees. You’re gonna love it. 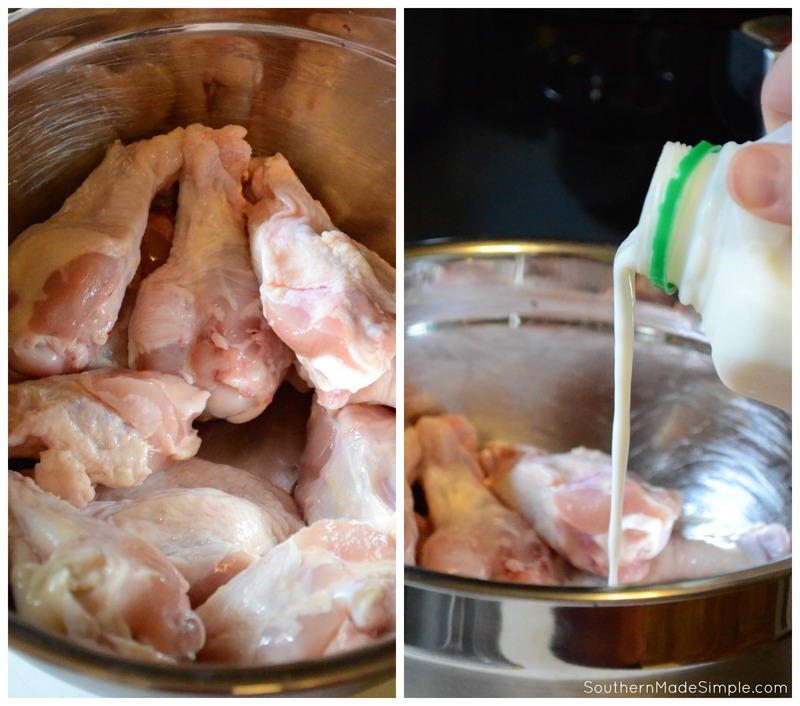 Do you have to use the buttermilk concept for the chicken? I’m sure there are many other methods of battering chicken without the use of buttermilk, but I am not familiar enough with any of them to suggest or recommend them. If you find a substitute please let me know! I’ve run into having flour spots left on my chicken once before, but I found that it was due to overcrowding the chicken in the fryer and not turning the chicken frequently. Try adding less chicken into the fryer next time, or increase the cook time by just a few minutes to see if it helps. It’s hard for all of the air to circulate around the chicken and make the skin good and crispy when there’s too much in there. I have tried the fried chicken recipe in the book twice now and both times the chicken comes out dry and white powdery looking. The first time I tried cooking four legs the second time one breast. Ours too! And we didn’t crowd the pan. Should we be spraying the chicken with oil? Awesome made it twice now. Best chicken ever. Definitely don’t over crowd and turn every five minutes.. Comes out great. 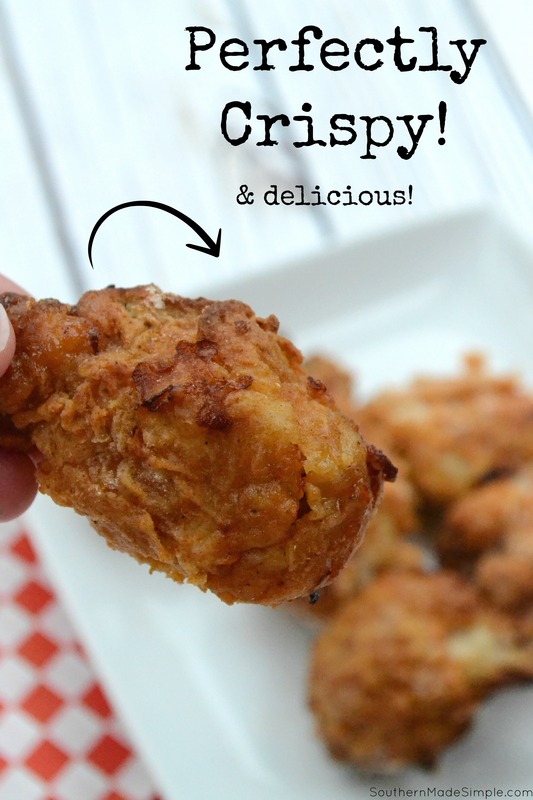 I just did thighs and drumsticks in the fryer using this recipe – 7 pieces total. At 25 minutes on 360, they were half raw. Added 5 minutes, but still nope. Removed all but 2 drums and 2 thighs and added another 6 minutes. Still bleeding. Added 7 minutes and nuh uh. I finally did those 4 pieces at 400 for another 10 minutes and they were still leaking pink. So… 40 minutes at 360, then 10 minutes at 400, and this chicken is bloody and disgusting. I am not a Power Air Fryer XL representative or technician (just a fellow user,) but it sounds to me like your machine just isn’t working right. Have you tried reaching out directly to them to troubleshoot? I’m sorry your chicken wasn’t cooked. That’s no good! Has anyone ever cooked whole cut up chicken pieces like this? Mine did not come with a basket, only the wire mesh shelves. I used the shelves and did not let the chicken touch. Also, I did not double dip them! Soak in buttermilk, dredge in flour once, shake off excess and place on wire racks not touching. Crisp, light and delicious!!! This recipe was so good! Came out PERFECTLY in my air fryer. 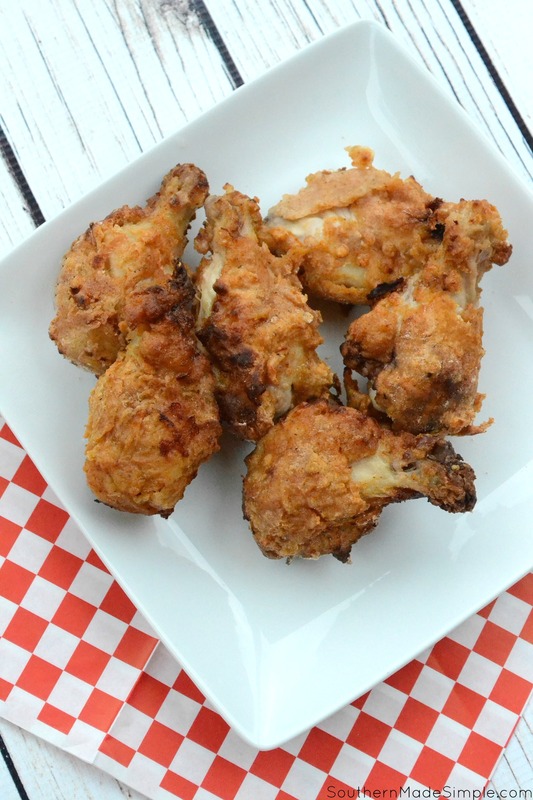 Air fryer cooking is easy – but you still need to bring the flavor. 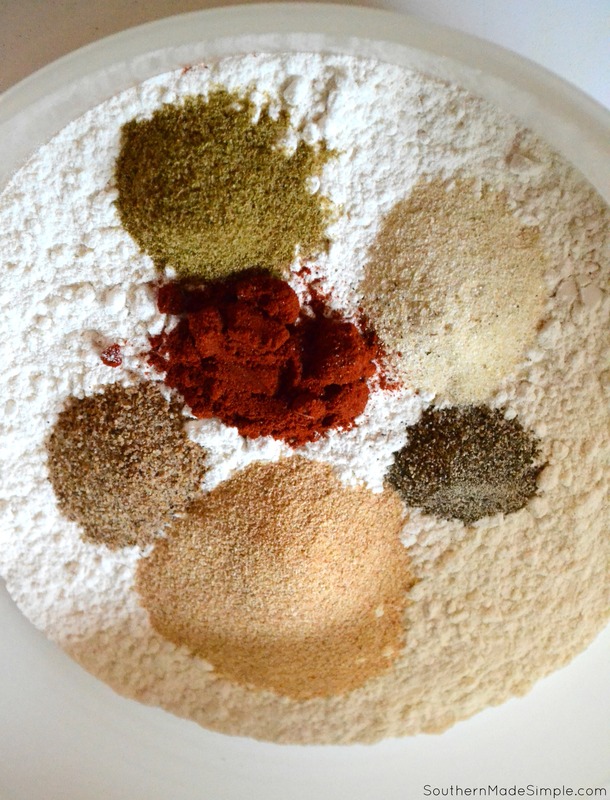 This mix of seasoning mails it! This sounds amazing. I’m wondering though, has anyone tried this and then frozen the chicken pieces? My son loves thighs and if I could figure out a way to cook them, freeze them and then cook from frozen (all in my Air Fryer, of course) both he and I would be very happy campers. This is not a spicy mix at all. If spice isn’t your thing, you can omit the paprika, but I really think this spice gives it more flavor than heat. Hope that helps! Really need a better crust! But thanks for this good recipe! Do you have to use buttermilk and plain flour ? I have never tried it any other way that what’s listed in my recipe, so I can’t speak for how it would turn out, but I’m all for making substitutions in cooking that meet your tastes/needs! If you try it a different way I’d love to know how it turns out! I just did legs and thighs, did not use buttermilk. I used all purpose flour, Old Bay seasoning, get their cajun blend if you like a little spice (you can replace this almost any seasoning that suits your taste, ie, Italian, whatever ) and seasoned salt mixed in one bowl, beaten egg in another bowl, and panko bread crumbs in a third bowl. The dredge would be flour mix/egg/flour mix/panko bread crumbs. Preheat fryer to 390 for about 5 minutes, then put chicken in the air fryer for 10 minutes at 390, turn the chicken over and reduce the temp to 370 for another 10-12 min. Turned out GREAT for me. Tried tonight, followed the recipe/instructions to a “t” and did legs and wings. They turned out great and the spice was just right. Will definitely spray the basket next time, but it’s still easy on clean up and didn’t loose much coating at all. THANK YOU! Hi Laura, dropping by to tell you that I loved your post and I love my air fryer!! Definitely, the best investment I have ever made for my kitchen! I have to try your recipe for fried chicken! I used buttermilk, No seasonings. Instead I dredged in Louisanne Chicken, seasoned mix.. I followed cooking instruction exactly as recommended. Tender crispy fried chicken. It was really very good. A little spicy but worth it.